Andy "Spyder" Herron writes about the "personal memetracker" that's hidden in FeedDemon 2.0.0.25. I had hoped to complete this feature by now, but as Andy points out, it still needs some work (which is why I hid it and gave it a "beta" label). If you'd like to try it out, select "Popular Topics" from the Browse menu (or just add the "Popular Topics" toolbutton to the toolbar above FeedDemon's browser). I should add that this feature will probably be useful only to people who subscribe to a lot of feeds since it relies on common links to determine popularity. So if you're not subscribed to feeds which link to the same articles, chances are it won't show you any results. However, if you're a real feed junkie, this feature should really help you discover what everyone is talking about. "You can do a decent job of figuring out if you've seen an item before and not show it to the user if you look at the title of the story....It ain't perfect, but then neither is anything else in the world." Dave, I understand where you're coming from - as an aggregator developer, I've certainly seen enough to know that many feeds are far from perfect, and it's up to developers such as myself to handle imperfect feeds without involving the end user. But I disagree that title is reliable enough to use for de-duping. If you're subscribed to a lot of blog or news feeds, then yes, this likely works well enough (for the exact reasons you stated). But there are many other feed sources out there, some of which use the same title over and over again (and they often don't use guids, so you have to rely on various combinations of title, pubDate and link to determine uniqueness). For example, I'm subscribed to a bug report feed in which all edits to the original bug come through with the same title. I'm also subscribed to a feed from a web-based forum in which all replies to a specific forum post have the same title prefixed with "RE:". We'll see many more feeds like this as RSS continues to break out of the blog/media world, so I don't think title alone is good enough for de-duping. FeedDemon 2.0 build 25 is now available. This new build contains fixes for the security vulnerabilities I described last week, and it also includes the performance improvements I mentioned last month. Note: Just install this directly on top of your current version, and your existing settings will be retained. Looks like the RSS world is abuzz with talk about feed security due to SPI Dynamics' presentation at Black Hat USA 2006. FeedDemon is not vulnerable to any of the more serious exploits they reported - so you can imagine my surprise at seeing news reports which listed FeedDemon among the vulnerable RSS readers. Because of this, I'd like to take a few minutes to go over some of FeedDemon's security features. This provides an initial layer of protection, but FeedDemon goes a step further. As SPI Dynamics pointed out in their presentation, RSS readers which embed Internet Explorer run the risk of permitting script to operate in the local machine zone, which means that the script is treated with a high level of trust - including the ability to access the local hard drive. However, FeedDemon is not vulnerable to this security flaw. FeedDemon makes use of IE's local machine zone lockdown, which forces local content to operate in the more secure Internet Zone. So even if a malicious feed creator somehow finds a way to trick FeedDemon into executing script, that script won't be able to do anything harmful. PS: Apologies for not enabling comments for this post, but I'll be away from my computer this week and can't risk the comment spam. 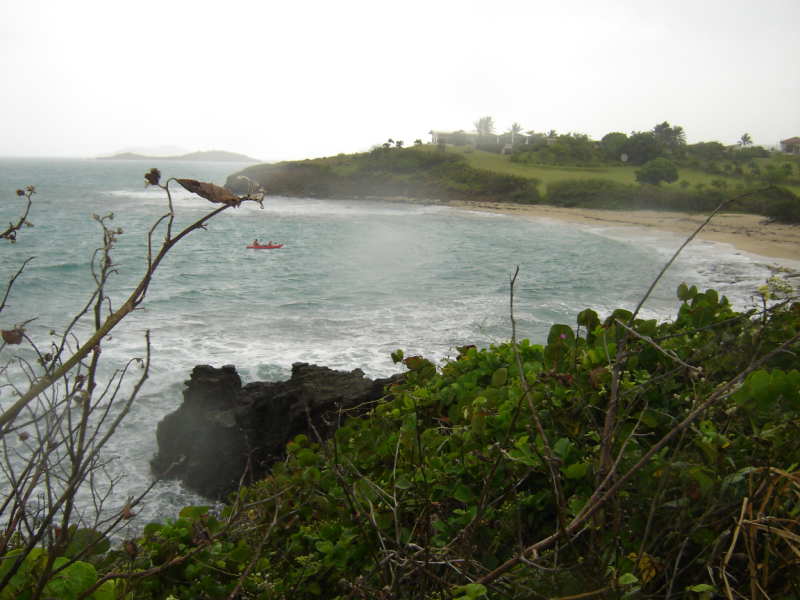 I spent the second week of my month off in beautiful St. Croix, and it was a memorable time. But there was a day that I'd like to forget about. It started when I decided to take my seven-year-old son Isaac out in a tandem sea kayak, something he's enjoyed several times before. It looked like a storm was brewing, but I thought it would be a while before it reached us (yes, that's the "dumbass" part - I'm still kicking myself for having such lousy judgment). Our destination was a small beach not far from our hotel. My wife and our five-year-old daughter Hannah decided to walk to the beach and meet us there, where we figured we'd collect shells and maybe do a little snorkeling. The waves were choppier than usual, and we were paddling against the current most of the time, so it was a lot of work to get anywhere. But it was worth the effort - Isaac loved riding the waves, yelling "woo-hoo!" every time one hit us. Shortly after we reached the beach we saw that the storm was coming quicker than expected, so we packed up and got back in the kayak. As we paddled away from the beach, the wind picked up and the water got even choppier. Isaac was still having a blast, but I was getting worried - for good reason, as it turned out. A few minutes later a wave turned us over, knocking us both into the sea. I came up for air, but I couldn't see Isaac - and quickly realized that he was trapped under the kayak. I swam beneath the upturned kayak and saw him struggling to get out from under it, so I grabbed him and pulled him to the surface. Right then and there he looked at me and said, "Dad, did you just save my life?" I said, "yeah, I think I did." His simple reply was "thanks." But we weren't out of danger yet. The current was taking us in right where the waves were crashing against some large rocks beneath a cliff. I knew that if I didn't get us out of there we'd be smashed against them. There was no way I could get us both into the kayak without turning over again, so I told Isaac to grab onto the back of the kayak, and then held the front of it with one hand and swam as hard as I could. The only way to steer clear of the rocky shore was to swim against the current - hard enough by itself, but near impossible while pulling a kayak with a 70-pound kid attached to it (especially when waves are tossing you around). I honestly wasn't sure if I could do it. I figured if I failed to get us clear of the rocks, I'd let go of the kayak, then grab Isaac and hold him in front of me and let the rocks hit me rather than him. Apparently the thought of that gave me enough motivation to swim even harder, and after about 15 minutes we were far enough away from the rocks that I could make a beeline for the beach. To Isaac's extreme credit, instead of panicking he helped keep us moving by kicking his legs as he hung on. When we were close enough to the shore, my wife swam out and grabbed our son, hugging him with all her might. I pulled the kayak to land, then dropped to the beach exhausted. Needless to say, we feared that Isaac would be pretty shaken up by the experience (he was). We reassured him a lot that day, and I laid next to him that night in case he had trouble sleeping (he did). But a few days later - when the weather was calm and the waves were small - Isaac surprised us and decided that he wanted to go out in a tandem kayak again. We've always taught our children to face their fears (within reason), and he didn't want to be scared of kayaking since it was something he enjoyed.